With an award-winning series to her name, journalist Dani Gallagher is anxious to find her next big scoop. . .she just doesn’t expect it to come from the past. But while searching for answers connected to her latest story, Dani discovers a tattered journal in an alley near Bracciano, an Italian restaurant run by Nicky Fiorini. The diary, written in the Roaring Twenties by a young girl caught in a web of organized crime, mentions Nicky’s restaurant, and despite an explosive first meeting, Dani persuades Nicky to help her uncover what happened to the girl—and what her story has to do with their present. Nicky is frustrated. No matter what he says, he can’t seem to convince Dani that she’s treading on thin ice. Her zeal to make a difference for others is leading her into some precarious situations—and just might get her hurt. 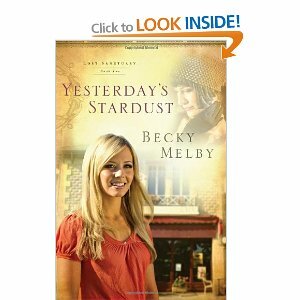 Another wonderful story by Becky Melby from her Lost Sanctuary Series. Book 1 was called Tomorrow's Sun which I read a few year back. (Note : I actually read this a few years back too but just never got the review published). Anyway Becky is very good at infusing past and present that is based in the same location into her story which she did for Tomorow's Sun and which she does here too in Yesterdays' Stardust. The story wasn't very exciting but decent enough for me to enjoy and if you like contemporary and clean type of novels, this would be for you.